Principal of Jews' College, London; born at Jutroschin, Prussia, April 29, 1833. He studied at the universities of Berlin and Halle (Ph.D. 1862), and concurrently with his university studies he read Talmud. Settling in Berlin, he was appointed principal of the Talmud school, which position he resigned in 1865 to accept that of principal of Jews' College, London, in succession to Barnett Abrahams. In 1867 he published a German commentary upon the Song of Songs. He has since taken an active part in the educational progress of the community at large. Friedländer has displayed considerable literary activity. As a member of the Society of Hebrew Literature he has published under its auspices: (1) "The Commentary of Ibn Ezra on Isaiah"; (2) "An Essay on the Writings of Ibn Ezra"; and (3) a translation from the original Arabic, with notes, of Maimonides' "Guide of the Perplexed." 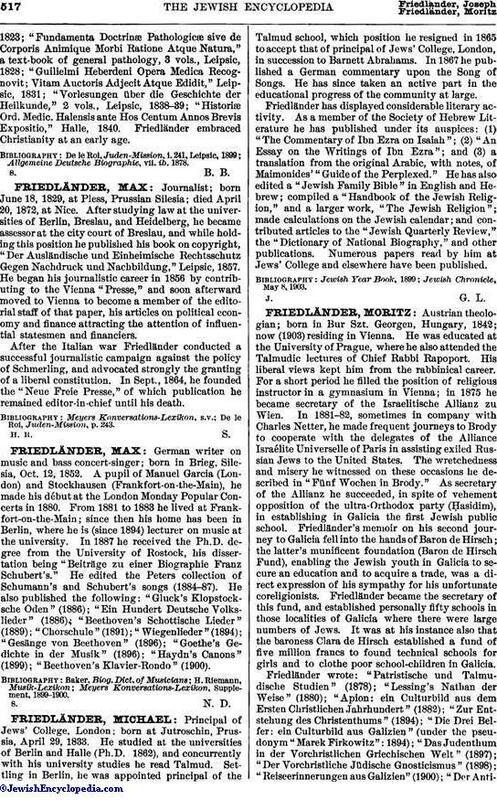 He has also edited a "Jewish Family Bible" in English and Hebrew; compiled a "Handbook of the Jewish Religion," and a larger work, "The Jewish Religion"; made calculations on the Jewish calendar; and contributed articles to the "Jewish Quarterly Review," the "Dictionary of National Biography," and other publications. Numerous papers read by him at Jews' College and elsewhere have been published. Jewish Chronicle, May 8, 1903.